Asteroids for the Atari 2600 is not the same thing as the arcade version. It’s got simplified gameplay and rasterized graphics. But Darrell Spice, Jr. has just created Space Rocks, a homebrew Atari game which brings arcade elements to the home console. Space Rocks is as good as it sounds, and the player customizability is deep but intuitive. 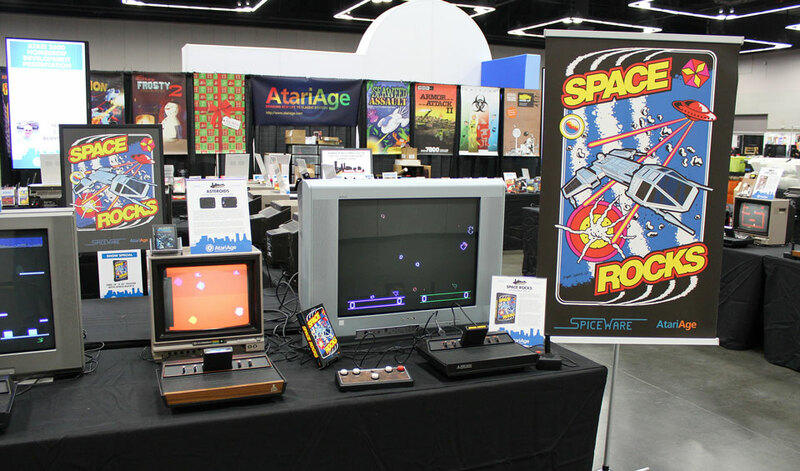 It was released at the Portland Retro Gaming Expo in October 2013 (pictured above), and available for purchase from AtariAge, as a dedicated cartridge with professional-looking packaging and artwork, for play on a real Atari 2600. The final version of the game can also be downloaded for use with the Atari emulator Stella, or with a Harmony Cartridge for the 2600 via an SD card. The ROM is freely available in this discussion thread – to find it, take the very first link, for Release Candidate 7. “I was working on Frantic, a remake of Berzerk/Frenzy, when I wondered if the Kernel for Frantic could be used as a basis for a remake of Asteroids. TIA, the Atari’s video chip, is so primitive it only has enough information to draw a single scan line on the TV. The Kernel is the part of the program that updates TIA in real time, scan line by scan line, in order to create the display. “The Kernel would have less to update, as Space Rocks doesn’t need the playfield (the chunky background graphics), so repositioning of the 2 sprites (yep, the 2600 only has 2 sprites) could be done more frequently than in Frantic. I thought that would result in result in less flicker, but wasn’t sure if it would be acceptable or not so I did up a quick test. Visit his website spiceware.org for more information.